Here it is the middle of the month and I’m just getting myself into gear. The holiday time just seems to flow along and then there seems to be a bunch of little chores that need attending to. Suddenly seed catalogues and packets of trial seeds arrive to remind me that it’s time to get back to work. A packet of cascading Snapdragons, “Cascading Chinese Lanterns,” from McFayden seeds, looks very interesting and will surely get a test this summer. I spent an hour or two in the basement yesterday, dealing with the jungle under the lights. The Geraniums and most of the Begonias had been growing well over the past weeks and had reached into the lights. It was time to do some pruning and in the process create a bunch of new cuttings to increase our production. Some of the Bonfire Begonias that I had cut back earlier had not liked the idea and had simply rotted and disappeared, making me a bit more careful about the process this time. I tried to make sure that there was some evidence of side branching already starting at the pruning point. 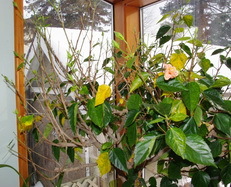 I want new cuttings but I also want bushy well branched plants to put into the containers in the spring. We are on a Begonia learning curve here and it’s always fun to see how new plants react to old techniques. The most interesting and trusted press release I receive about new varieties is always from the All America Selections people. They are a large organization that does extensive trialing of many new varieties before they announce their awards each year. I’m excited this year because there are three new vegetable awards. ”Gretel” is a new eggplant that will be wonderful in containers producing clusters of small white fruit. “Lambkin” is a white fleshed melon that will mature in 65 -75 days from transplanting. The third veggie is an acorn type Squash, “Honey Bear.” It has a sweet flavour but its main attribute is its resistance to powdery mildew. The one flower getting an AAS award this year is a Viola, “Rain Blue and Purple.” It’s main claim to fame is the flower colour which changes from purple and white to purple and blue as the flowers age. Are spider mites and snow related?? The snow arrived early in my garden this year and it has managed to stay around. The spider mites on the plants that we are overwintering indoors will always show up eventually. This year they were building webs across the ends of the Banana plant before Christmas and the Hibiscus went from full flower to half defoliated before the new year. I know that no matter how well I spray them before I bring them indoors, the spider mites will eventually show up but they usually don’t bring Christmas presents. The sprayer of insecticidal soap and pyrethrins is now sitting out and ready to be used every few days. The wretchedly promiscuous spider mites can produce a new generation every four days and the spray has no effect on the eggs. Does make the walls and floor quite shiny and sticky though. There are some good things happening as well. The Phalenopsis Orchid has five new blooms on an old bloom stalk and a whole new stalk is developing well. The patterns on these ‘moth orchid’ flowers are quite amazing. Lots of dots and streaks of vibrant colours. They are readily available in garden centres and flower departments. Buy one and enjoy the flowers for several months. Just look for a plant that has a flower stalk with a few opened and several unopened flowers and you will easily get your money’s worth. 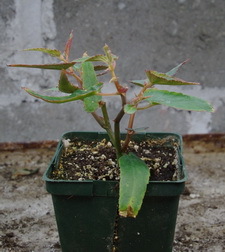 Getting them to rebloom another year is quite easy and the plants are relatively small, usually 3 -4 leathery leaves in a 15cm pot, for the flower power that they provide. They will need a fairly bright window to make them flourish but it’s amazing how long they will continue to bloom in even a normally lit room. On the floor of the solarium are the much less elegant pots of Cymbidium Orchids. Long rather beat up looking grass like foliage that has little to recommend it except for the multiple bloom stalks that are rapidly reaching above this foliage. In another few weeks they will open into these gorgeous Orchids and the plainness of the foliage will go unnoticed. I’m writing this from our nation’s capitol where the weather is bright and sunny but outside in that sunshine it is a bone chilling minus 25C or 10 below zero F. for our American friends. 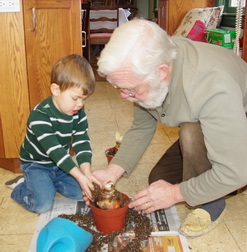 I’m helping my delightful grandson watch his Amaryllis grow. We had a great time planting it at Christmas and he likes to point out that the one, that is now 30cm tall, is his, while the one that has just started to grow is his younger brothers. It’s really just a variety difference but such horticultural details are lost on a 2 ½ year old. We are all waiting patiently for the large bright blooms that these Amaryllis bulbs produce so readily. Donna Asks? Is it possible to grow your own mushrooms in a basement or similar location and where would I get information and be able to purchase spawn to start them? I once purchased a kit that produced oyster mushrooms. It came with the substrate already inoculated with the spawn and I simply had to soak it. It actually worked and produced a reasonable quantity of mushrooms. Dominion Seed and mycospore.com both are in Ontario and offer mushroom kits.